Author Megan Pugh is, among other things, a dance person. She doesn’t just examine dance history as a scholar, she feels it, is excited by it, and shares her excitement with her readers. She is also a keen cultural observer who is able to place her reflections on the art form into the context of the country’s sociological landscape for each period she describes. Pugh’s smooth-flowing narrative opens with an homage to the contributions African Americans, both slave and free, made to the establishment of a truly American dance form. She is able to celebrate that contribution while pointing out the painful irony of the enduring atmosphere of Jim Crow racism surrounding that contribution. 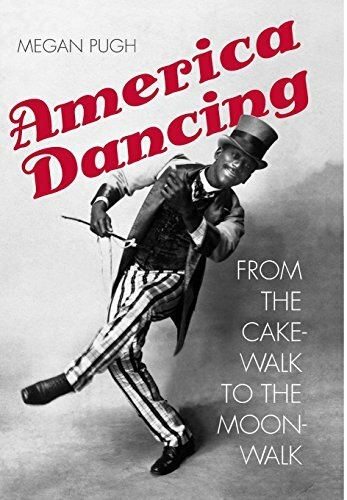 An early anecdote in the book describes black artist Bill “Bojangles” Robinson, a world renowned tap dancer, getting arrested in 1939 for standing too long on a Times Square sidewalk while admiring a large advertisement for a show in which he was the star. While Pugh’s focus is hardly limited to the world of black dance and dancers, her interest in the influence of both race and class on the growth of American dance makes that world a recurring thread in her book. It is not at all the only thread that helps weave her fascinating tapestry. She examines the Americanization of ballet with the inclusion of such diverse stylistic elements as break dancing, western folk themes, jazz, and tap. Her analyses of the multi-directional influences of modern dance, Broadway dance, movie, and television dance are impressive. The author has the valuable skill of being able to take both a macro and micro view of various aspects of her subject. For example, in her examination of modern dance developments, she reports on choreographer-dancer Paul Taylor’s work both against the background of his personal life and problems, and as it was regarded within the framework of the modern dance world of the time. While America Dancing maintains its scholarly decorum throughout, it does not look askance at the pop in popular culture. The section on Michael Jackson’s impact on America’s dance vision, for instance, gives a number of good insights. The book also includes a valuable list of dance films and videos. In addition, there is a section of notes and references that will be appreciated by researchers and all those who desire a more academic approach. America Dancing is an important entry into the literature of American dance history. It deserves recognition as a classic, right alongside Don McDonagh’s memorable work, The Rise and Fall and Rise of Modern Dance.